This is a very small set that was in amongst the bulk lot. It’s pretty unassuming, and quite disappointing, although it’s unique for me as it’s the first set I’ve put together with the larger detailed minifigures. They don’t really look like LEGO, but they definitely are! 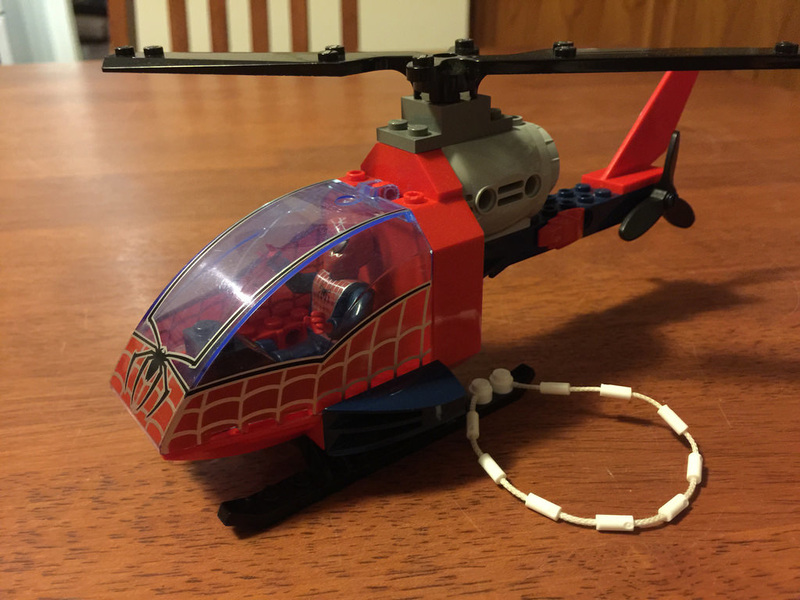 The helicopter, while bigger than standard minifigure scale, is made up of only 15 parts. Likewise with the other builds in the set, they’re all very big parts. I was missing the ramp and the complete motorbike, but even that didn’t really add much. There are a few elements that are not seen in many other sets, such as the motorbike fairing, the side skirts of the chopper, the tail fin, and some of the decoration elements. 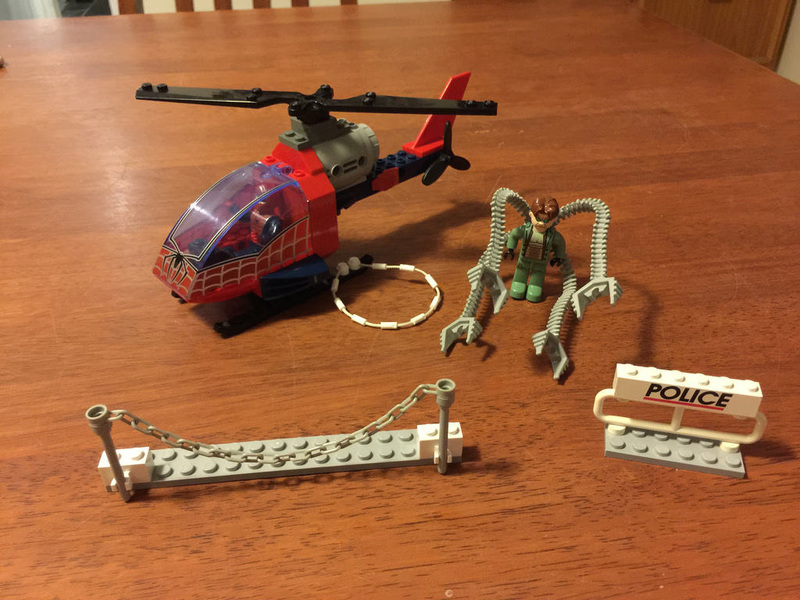 The only parts that I would consider being worth having in this set are the white string (web for Spidey), the long length of chain, and the engine. The tail of the helicopter is interesting, but the front is really only useful for one thing – being a helicopter cockpit! ​The minifigures are pretty interesting though. From what I can tell, the bigger size was first seen in the failing Jack Stone theme from 2001. They are a little bigger than a regular minifig, with the larger being a full head taller. No parts can come off, so there’s no detaching the hair, arms or legs, or even the head, but there is a lot more detail. After the Jack Stone theme failed in 2003, it was replaced with the 4 Plus Theme, otherwise known as 4 Juniors, which this set comes from. This theme crossed over into many areas, including police, fire, construction, Spiderman, and even Pirates. It didn’t last long, ending the next year in 2004. Being intended for junior LEGO fans, the helicopter would be fun to swoosh around, but I can’t imagine it would hold their attention for very long. If the bike is there, then the ramp can provide some fun aspects, but there isn’t all that much. 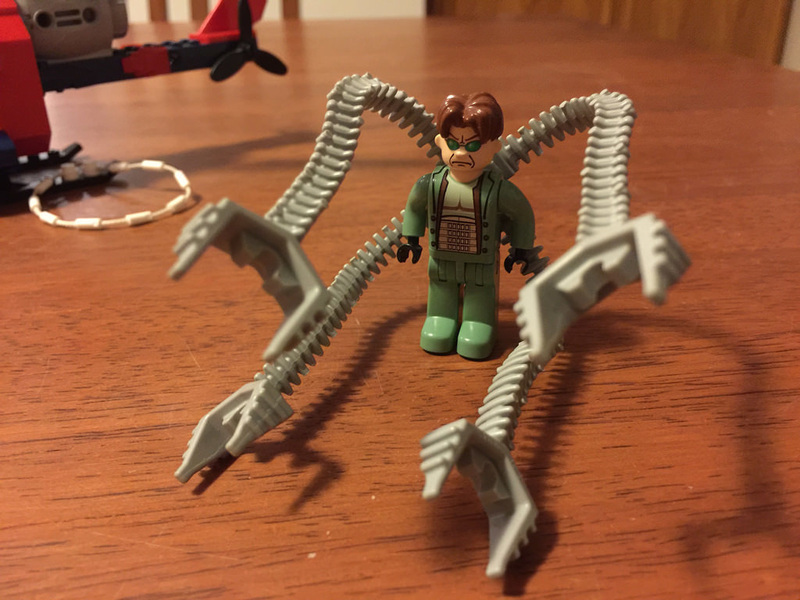 Doc Ock has his big tentacles, but they can’t really grab on to much, and are not flexible unless you force them. If this set was the only LEGO set that a kid had, then I reckon they’d get bored pretty quickly. Now, I get that it’s a juniors kit, but it came together so quick, I highly doubt any kid would enjoy putting it together, as the build experience was so short! My experience was only drawn out slightly because I had to wander around my house to find the parts. The helicopter comes together first, followed by the bike, then the gates. There is really nothing to it. It’s clearly a helicopter, but it’s a pretty shoddy one. I also really don’t see the connection between the gates and the rest of the set either. I guess it was purely for something the bike could jump over? I was pretty disappointed by this set. 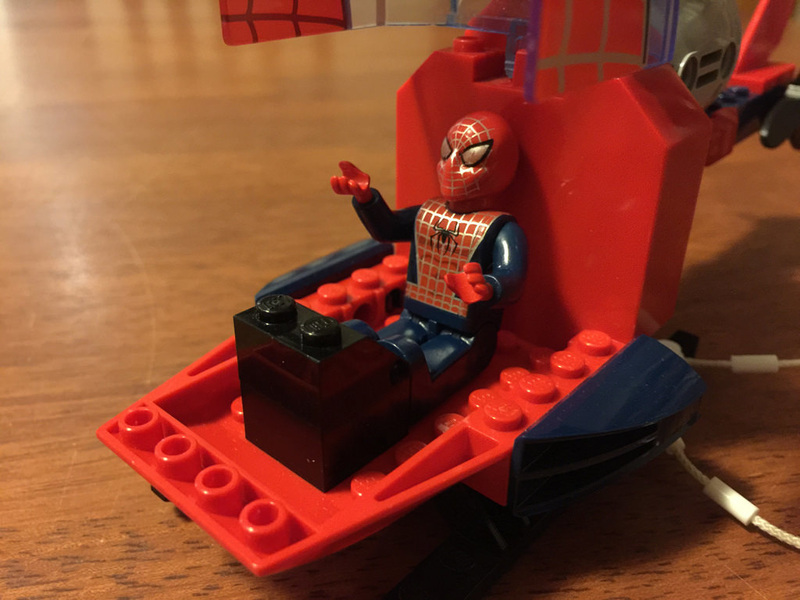 Sure, it’s probably got enough pull power to get kids to want it, but I’ve got a feeling that the power comes from the LEGO and Spiderman logos. It just looks unfinished. While the set is fetching close to AUD$50 on the second hand market, it means you are paying a fair bit for not much. The set is a bit of a shocker, and you’d probably be mad to spend that much money on a set this terrible. On the other hand, it’s quite collectible. From both a bigger minifigure standpoint, and coming from a theme that didn’t last long, it would be an interesting set to collect to see where LEGO went wrong, and how much it has changed over the years. Aren’t we all so glad that they did! Next up on the list is 7893: Passenger Plane! Hopefully it does better than this one did! What did you think of the set? Let me know in the comments below.